Set your dining table a month early and leave it that way……looks way more beautiful than a bare table! So, with that arsenal of goodies, it allows me to at least begin the process. I favor a “layered approach” to decorating. I will start it, in a perfect world right after Thanksgiving and do it little by little, adding a bit every day..this way I never feel totally overwhelmed. I always try to have a “deadline date” in my head. This year it is Dec. 12th, I hope to have it all done by then, fingers crossed! I cannot stress enough how far something as simple as fresh greens goes…..literally you can go to your yard and clip them which I have done many times and create something beautiful. I focus first on the main areas of the house, where we will be often and where visitors be. So that typically involves my kitchen, the powder room, the foyer and I work on the dining and living room because around the holidays that is an area that we tend to use more than any other time of year! Drape a fresh green garland over a mirror, on consoles or chests, add a bow and you have a magazine worthy vignette! Add a sprig or two on a powder room vanity, it gives it such a festive touch and smells yummy too! Set your dining table early Dec. and leave it that way, few things are as pretty as an elegantly set dining table…why not! Here is my front door…. A few days ago added a few sprigs of evergreen to the doggies, the fact that it was snowing was the perfect finishing touch! And just added my wreath to match, having a real love affair with magnolias this year! 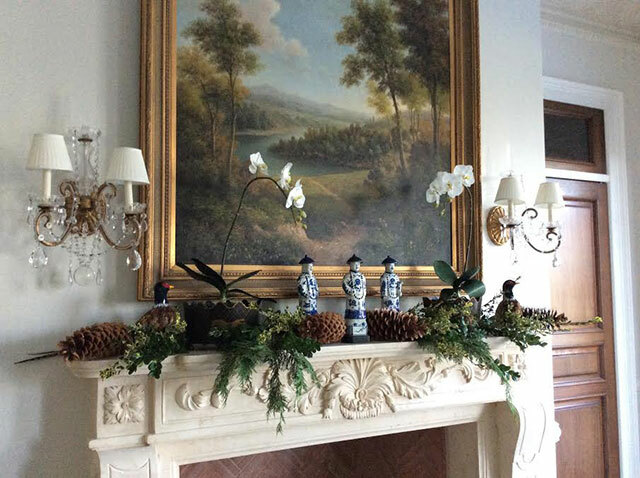 A pretty and surprisingly simple arrangement to make…..
My mantle in my dining room…. And the living room mantle…. Other vignettes around the house…. (and proof that blue and white is perfect for Christmas/holiday decorating)! Love a dough bowl filled with simple greens and sugar cones, easy and always gorgeous! I bought these faux evergreen swags years ago and put them on the sconces all the way down the hallway for a festive touch…. This year I bought almost no new decorations….. forgot how much I had until I started taking things down from the attic! :) I always go a bit crazy the day after Christmas with the great sales, it’s a perfect time to stock up. The only thing I did buy this year as I do every year is fresh greens and a case of sugar cones, which I use throughout the house. I put them up the evergreens as soon as 2-3 weeks before Christmas with no problem (people often ask). Thank you so much for having me Phyllis to your beautiful blog and to everyone else for stopping in. Wishing everyone a fabulous and joyous holiday season…ho ho ho! Lovely as usual Tina and the Blue and white is my joy. Are the Amaryllis and orchids real or silk? I struggle to keep mine alive in the South African heat! Tina is always an inspiration, but even more so for the holidays!!! I love her suggestion to dress the table early and leave it. On to that today! And, the simple idea of filling a dough bowl with greens and pinecones. I have one and am going to do this also today!! Thank you, Phyllis, for bringing us such incredible talent!! Such a feast for my eyes! Thanks to Tina and Phyllis for the magical trip into a stunningly beautiful home. I have a few more ideas on how to make my decorating for Christmas more elegant. Thank you both! What a lovely home! I especially love how she uses pine cones and natural elements in her arrangements around the house. I’m thankful we have an abundant supply of those here in the Northwest! 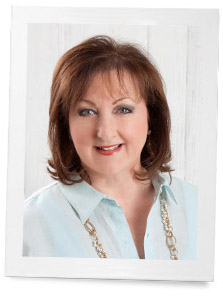 I’ve always loved Victoria magazine…fun to see there is a blog to follow along with also! What a beautiful home! I especially love how Tina uses pinecones and natural elements in so many arrangements. I’m thankful we have an abundant supply of those here in the Northwest! Thanks for sharing such lovely Christmas decor. Thanks for the reminder to use green sprigs and boughs from outside to bring inside for this special seasonal beauty! here’s what i love about our friend tina: she doesn’t keep a good thing to herself. she is truly a blogger’s blogger because she knows how to create beauty around the home and then breaks it down so we can have success too. i actually feel convinced after this post that i can pull this off even though my home is nowhere near as grand! peace to you, phyllis. Perfect Tina! I’m with you 🙂 can’t ever get enough greens, pine cones and a pop of red here and there. Simple, elegant, festive .. beautiful! Inspires me to make my home beautiful for the holidays! Thank you so much! Phyllis thank you for featuring Tina, she is so very talented and has great style and panache! Phyllis thank you so much for having me over at your beautiful blog, I am so happy that you asked me to share…..hope your holiday preparations are going well:) All the best…..
You are always a joy to have as a guest! We all love you. Thank you Tina!! Tina is the absolute best when it comes to an elegant decor. Her Christmas decor is worthy of any magazine. HAPPY HOLIDAYS to all!